Since we love grilled cheese in this house, we decided to add "grilled cheese" to the bi-weekly menu rotation. This also means that we will be coming up with unique grilled cheeses in the future since there is no way we could stand making grilled cheese every other week and be happy with the lack of variety. As you may know, three of the five people in the family are back to college now (the fourth is heading to USC in the spring) and that means fast, easy and tasty meals are on the menu - and that also means everyone helps out with the cooking (at least one person, once a week - besides me). 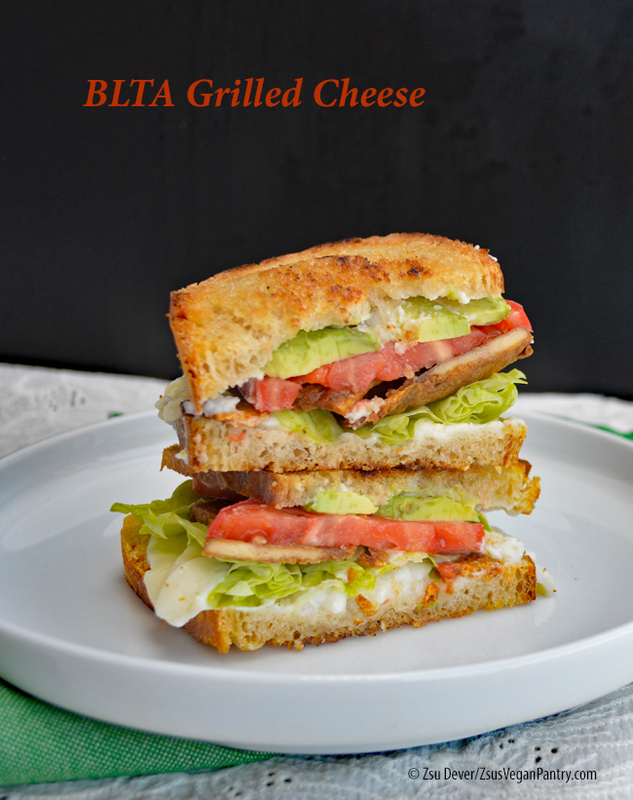 This past week we had BLTA Grilled Cheese sandwiches. Bacon, lettuce, tomato, avocado - all on a grilled cheese sandwich. Really, this can only be good. I used my bacon recipe from Everyday Vegan Eats (AMAZON) because it is STILL my most favorite bacon recipe hands down and it freezes really well so I make a huge batch and pull out what I need when I need it. 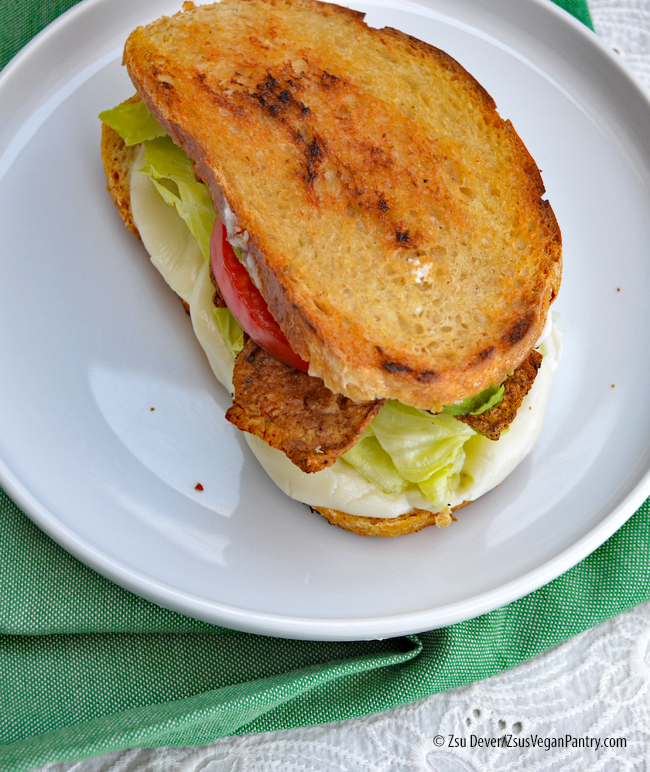 Toss it in the air-fryer and have crisp, crunchy, amazing vegan bacon. Use commercial cheese or make your own, but if using commercial block cheeses, use a mix of different brands to get a melty, gooey vegan cheese that isn't over-powering in flavor. Have at it - make grille cheese a regular addition to your menu and you can customize it and have lunch on the table in record time. 1. Butter one side of each bread slice. Spread mayo or avocado on the top slice of each sandwich. 2. Heat a skillet over medium-low heat, add the slices of buttered bread, top with cheese, bacon, lettuce, tomato and add the top slice of mayo-ed (or avocado-ed) bread (butter side up). Cover with a lid and cook until the bottom slice of bread is golden, about 1 to 2 minutes. 3. Flip the sandwich and cook, uncovered, until golden brown. Reduce heat if the bread is cooking too fast. 4. If the cheese is not melted, add a tablespoon of water to the skillet, tip the skillet to avoid making the bread soggy, cover with a lid and cook until the cheese is melted. Serve. This looks truly amazing! YUMMERS!